The Curious Confectionery is run by a wife and husband team who create "sweets with a story" and bring back historically significant vintage treats like popcorn balls. Their treats are made without preservatives or anything artificial, using non-GMO popcorn, sugar, and other ingredients when available. 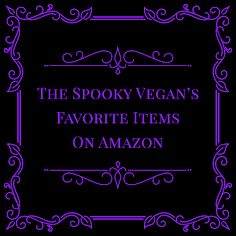 All of their creations are vegan, cruelty-free, handmade, and delicious! 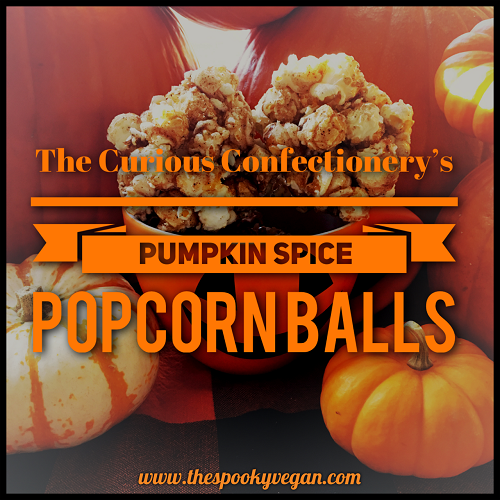 The Curious Confectionery's Pumpkin Spice Popcorn Balls arrived perfectly packaged, nestled four in a package. 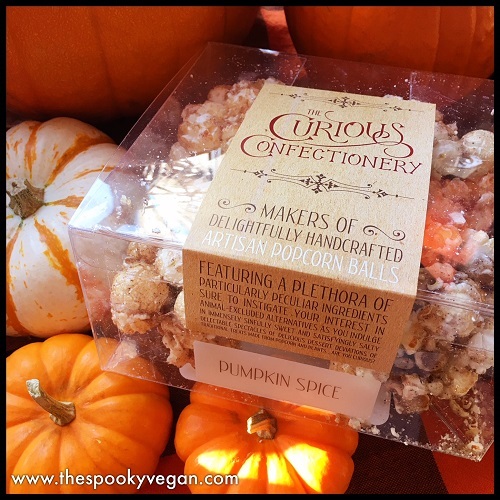 When I opened the box the sweet, sugary smell of the popcorn balls wafted up to greet me, accompanied by the scent of autumnal spice. 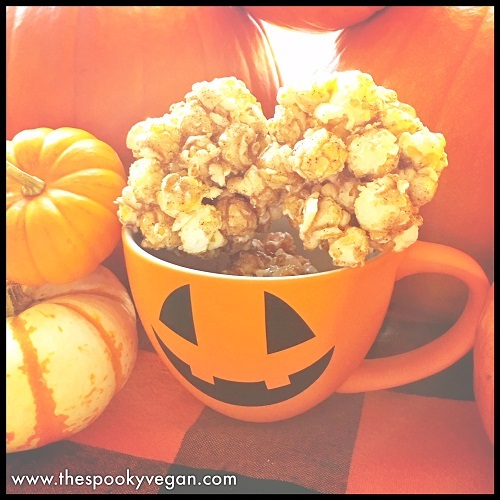 These Pumpkin Spice popcorn balls are made with perfectly popped popcorn spun with sugary sweetness into a ball and flavored with fragrant vanilla, pumpkin spice, and spiked with a hint of ginger. They taste even better than they smell (I seriously would wear a perfume based on the scent of these popcorn balls)! They are sweet, crispy, with the lovely warm, fall taste of pumpkin spice. 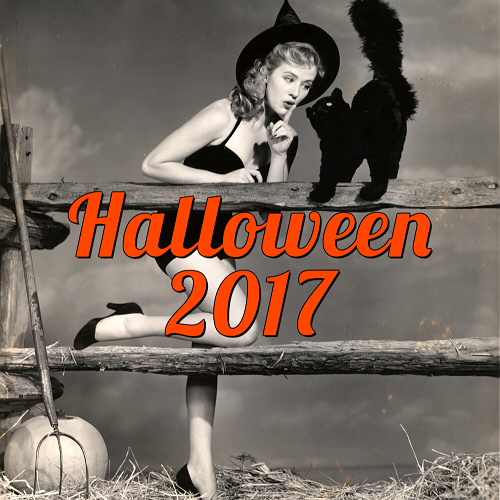 Their taste conjures up classic images of autumn - leaves falling, cozy sweaters, a gentle rain pattering on the window, cuddling on the couch to watch spooky movies, a steaming cup of coffee on a cool morning, and fields of orange pumpkins! Besides the Pumpkin Spice flavor, The Curious Confectionery also has other delectable popcorn ball flavors, like their Smoked Salted Caramel, Maple Pecan, Toasted Coconut, Hummingbird (which I reviewed previously), The Happy Hipster (packed chock full of superfoods! ), and November, a festive ball containing nutmeg, cloves, cinnamon and studded with cranberries and pumpkin seeds (it's a stunning show-stopper for sure!). If you love nostalgic popcorn balls, or are intrigued to try these delicious desserts, trick or treat yourself to these delectable treats! 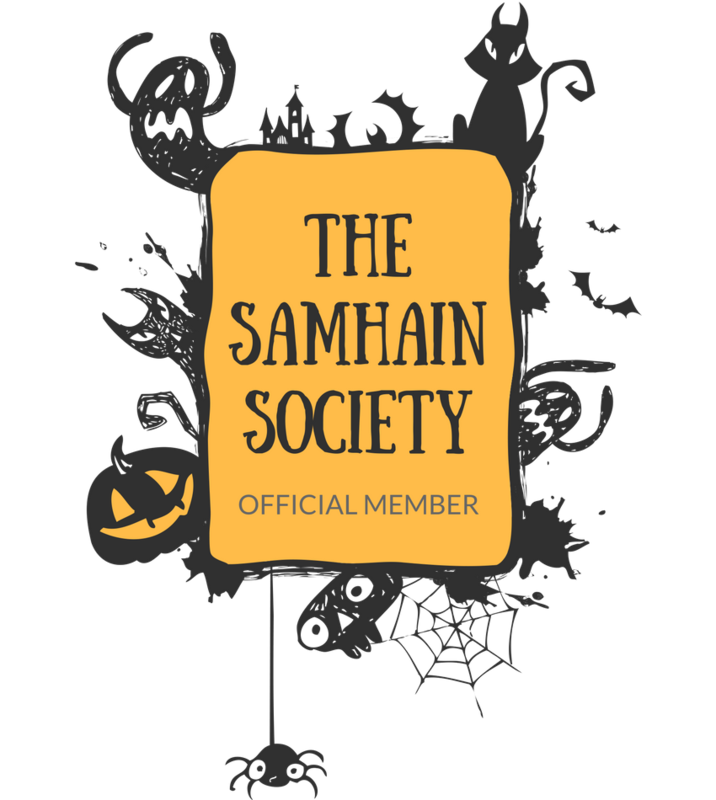 They would also make a fantastic gift, party favor, or Halloween party centerpiece. 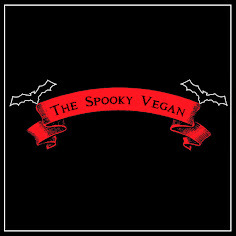 Right now and through October 22nd, you can save 20% off with the discount code SPOOKYVEGAN applied at checkout in The Curious Confectionery's online shop! With this amazing discount, you'll definitely want to stock up and perhaps even buy a few boxes for friends and family. UPDATE: Contest is now closed - follow me on Instagram for more giveaways! 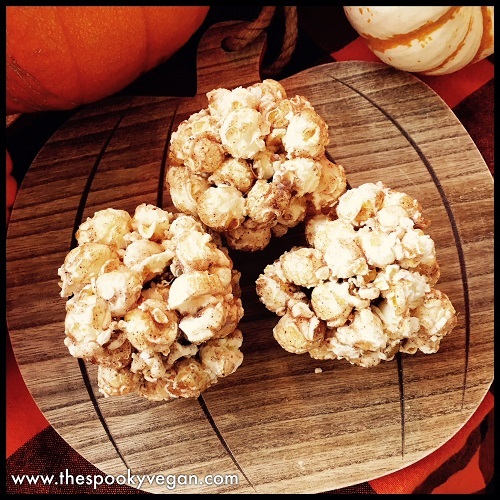 I am also hosting a giveaway where you can win your very own box of popcorn balls! Visit my Instagram for rules on how to enter.